It's time for the monthly Surprise Recipe Swap. This month I got to check out Heather's blog, Bake, Run, Live. Heather had so many great recipes to choose from, I really had a hard time deciding. So, I picked two! I'll share the second one, a little later on, if that's ok with Heather. What I chose for today was Heather's Maple Syrup Granola. The week prior to finding this recipe, we had an Amish man stop in at our office selling fresh Maple Syrup. We only use pure maple syrup, but I have never had syrup that fresh! I knew I wanted to use this syrup on something other than pancakes. At least part of it! So, when I found the Maple Syrup Granola, I new that was the destination for my syrup! This was my first time making granola without peanut butter, so I was a little hesitant. Sometimes I need that little nudge to try a new recipe. I can really get hung up on a favorite recipe and stick with it forever. I am glad for the nudge on trying this recipe, it is delicious! I used some ingredients that were new to me, and it was a complete success. Coconut Chunks are my new love, and I wish I new that coconut was in that form a long time ago! This granola was great to snack on, or put on top of yogurt. Some went into a batch of cookies, which was an amazing addition to cookies! I think my favorite way to use this granola was on top of frozen vanilla bean yogurt. YUM! Preheat oven to 300 degrees. Line a baking sheet with parchment paper. Set aside. In a medium bowl, combine all ingredients except the dried cranberries. Mix until everything is well combined. Spread evenly onto baking sheet. Bake for 40 minutes, stirring every 10 minutes. After 40 minutes, add cranberries and bake for another 10 minutes. Remove from oven and let cool. Store in air tight container. A wonderful recipe with the maple syrup flavor. Love all kinds of granola thanks for sharing! This sounds like some very tasty granola! I love the coconut oil in it! Pinned! I need to start making my own granola. I don't know why I haven't yet, but I think this will be the recipe to try! 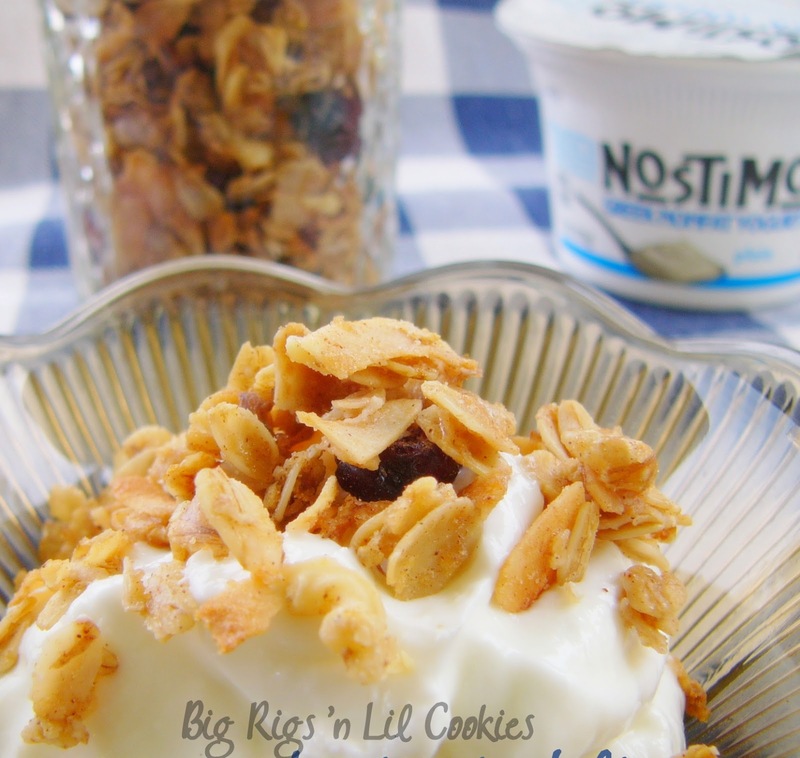 I love granola and eat it nearly every morning for breakfast, and this one sounds delicious! I'll have to try it next time I have some maple syrup on hand. Looks so yummy! This sounds so good! Great SRS choice! I love homemade granola! I will have to give this a try! Thanks for linking up to the In and Out of the Kitchen Link Party. Oh, Kris! This sounds & looks delish. I can just see putting this into my pancake batter :) Great choice! Kris....this granola looks soooo good! I have yet to try making my own granola but I think you may have given me the nudge I need! I bet that fresh maple syrup was an amazing addition to this recipe! The maple flavor sounds like a great addition to some homemade granola! Yum- this looks amazing, I love granola! This granola recipe sounds delicious! Thanks for sharing on Foodie Friends Friday! Maple granola sounds great..........Thank you for sharing with the Clever Chicks Blog Hop this week; I hope you’ll join us again!